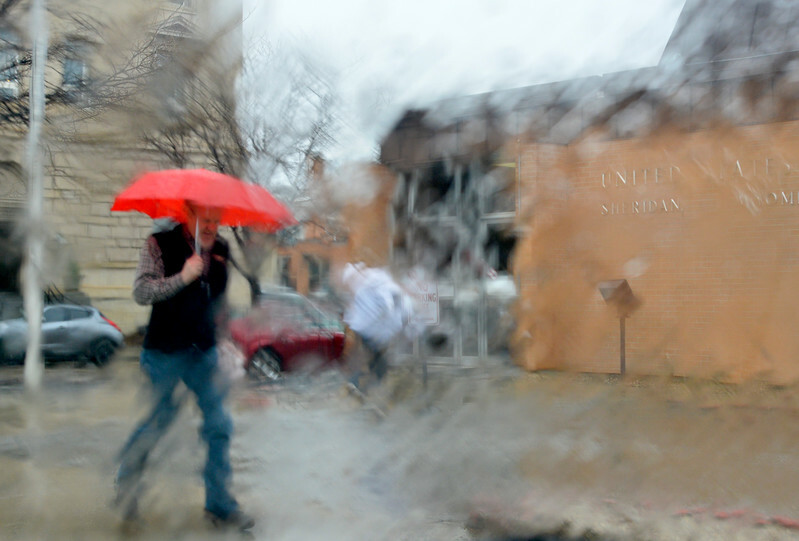 A man walks under an umbrella past the post office Tuesday morning as rain pours down. The National Weather Service issued a hazardous weather outlook, possible heavy snow in the Bighorns and some wet snow, hazardous driving conditions in the foothills. 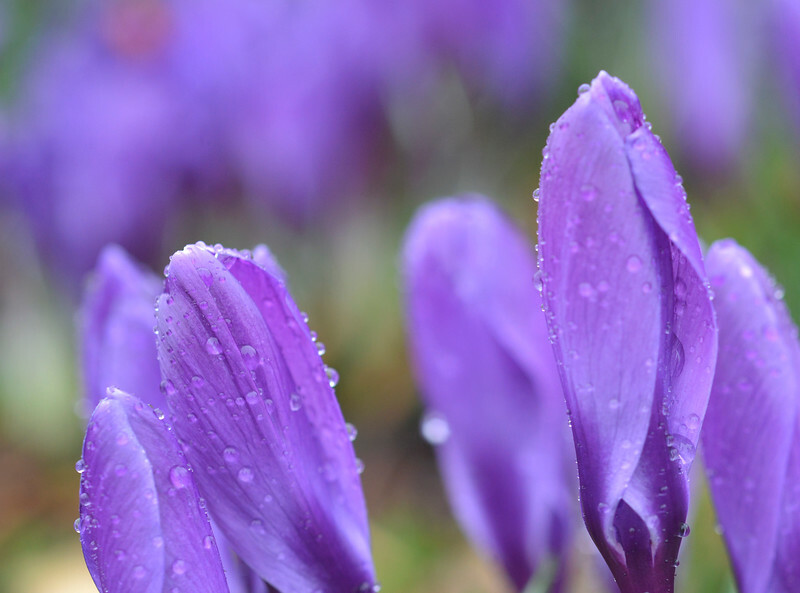 Rain drops collect on blooms at Whitney Park Tuesday morning. 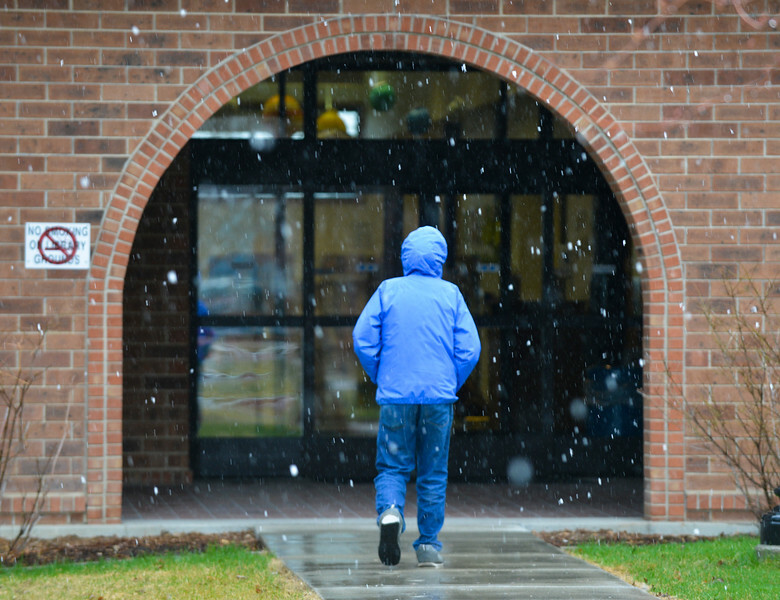 A person walk under a wintry mix Tuesday morning at the Sheridan County Fulmer Public Library. 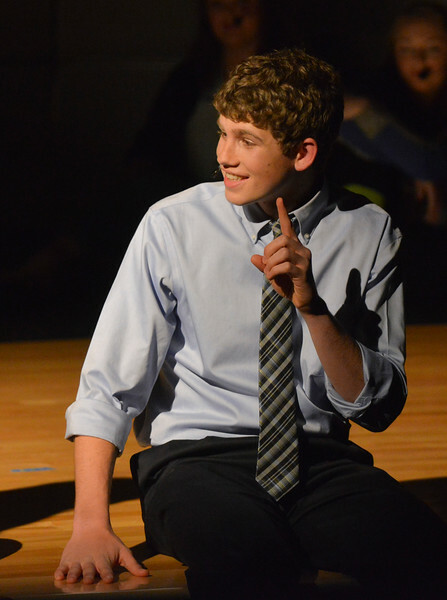 Tanner Warder plays Jesus in the play “Godspell” Tuesday night at Big Horn High School. The 1971 broadway musical by John-Michael Tebelak was performed by Big Horn students and directed by Dustin Olsen. Abigail McCallister rides Katelyn Gulley as Sierra Verley plays the good samaritan in the play “Godspell” Tuesday night at Big Horn High School. The 1971 broadway musical by John-Michael Tebelak was performed by Big Horn students and directed by Dustin Olsen. 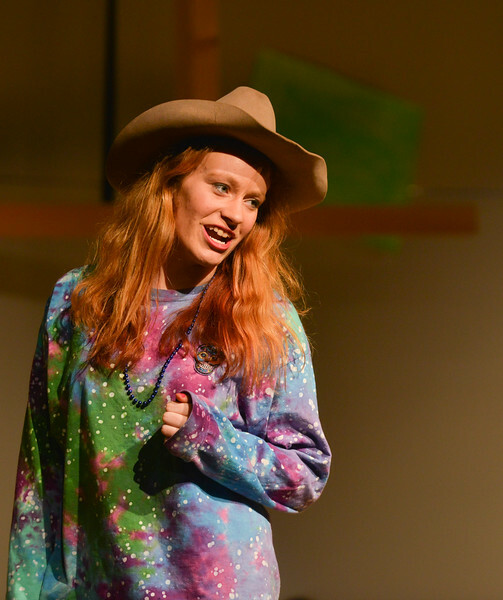 Sierra Verley sings a solo in the play “Godspell” Tuesday night at Big Horn High School. The 1971 broadway musical by John-Michael Tebelak was performed by Big Horn students and directed by Dustin Olsen. 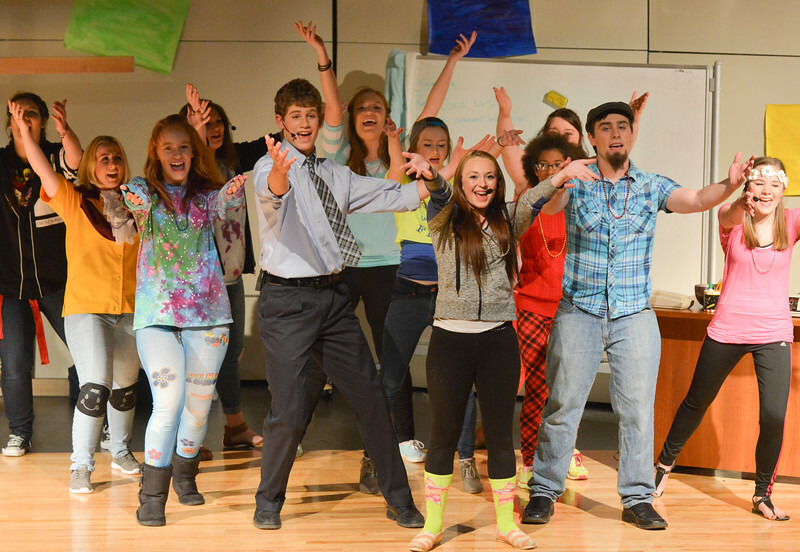 Students sing in the play “Godspell” Tuesday night at Big Horn High School. The 1971 broadway musical by John-Michael Tebelak was performed by Big Horn students and directed by Dustin Olsen. Tanner Warder, as Jesus, reacts as he is challenged by Judas, Abigail McCallister, in the play “Godspell” Tuesday night at Big Horn High School. The 1971 broadway musical by John-Michael Tebelak was performed by Big Horn students and directed by Dustin Olsen. 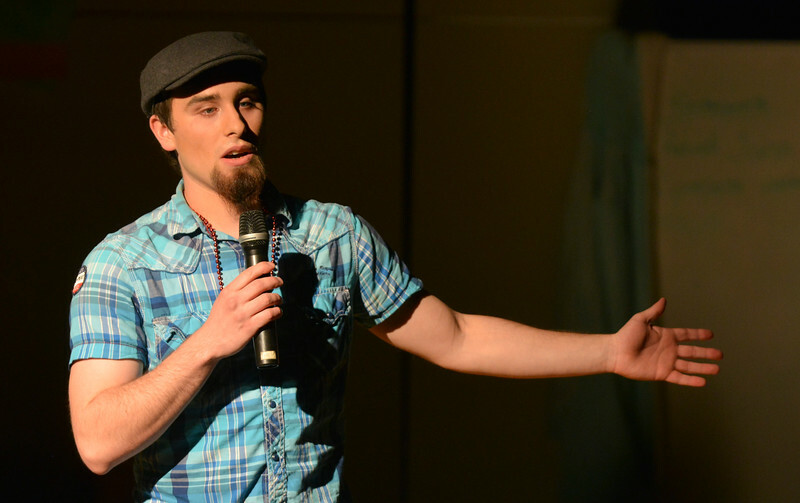 Chris Brown sings a solo in the play “Godspell” Tuesday night at Big Horn High School. The 1971 broadway musical by John-Michael Tebelak was performed by Big Horn students and directed by Dustin Olsen. 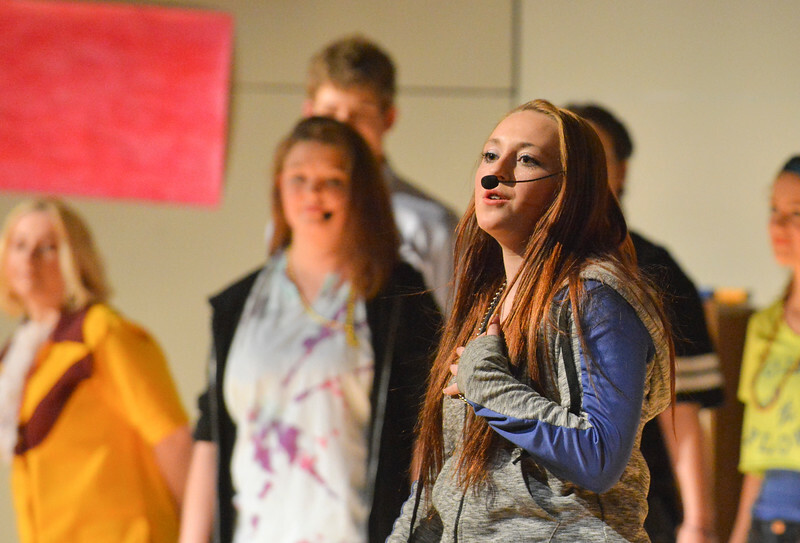 Trinity St. John sings in the play “Godspell” Tuesday night at Big Horn High School. The 1971 broadway musical by John-Michael Tebelak was performed by Big Horn students and directed by Dustin Olsen. 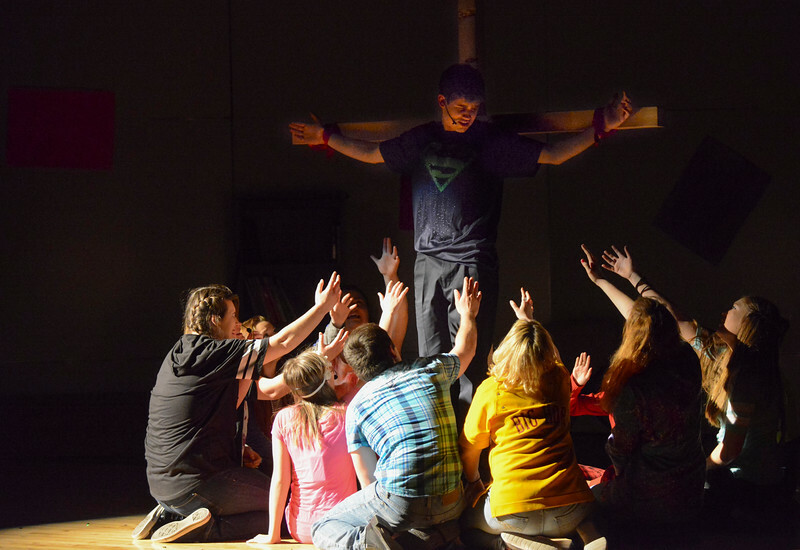 Tanner Warder, as Jesus, is crucified during the play “Godspell” Tuesday night at Big Horn High School. The 1971 broadway musical by John-Michael Tebelak was performed by Big Horn students and directed by Dustin Olsen. 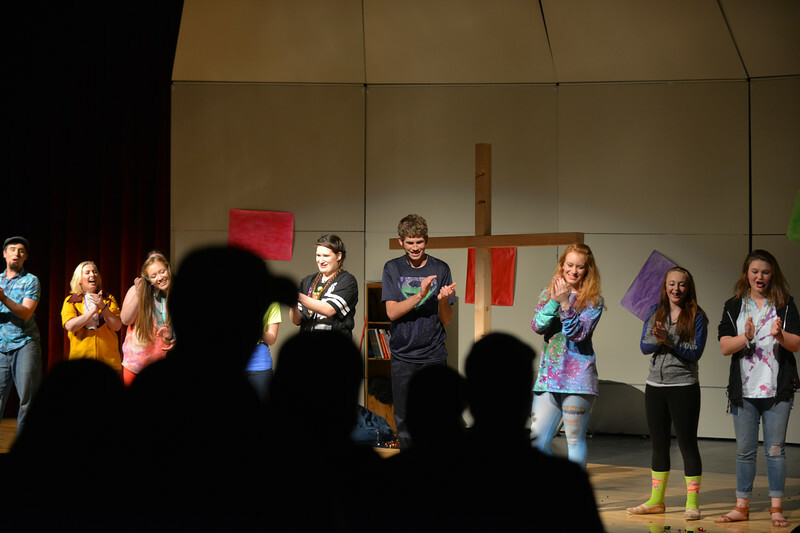 Student actors return to the stage to bow after the play “Godspell” Tuesday night at Big Horn High School. 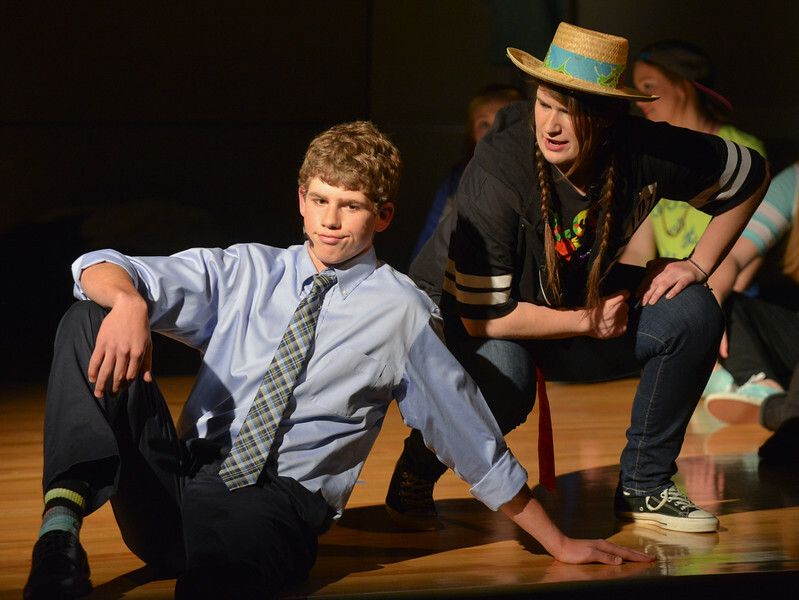 The 1971 broadway musical by John-Michael Tebelak was performed by Big Horn students and directed by Dustin Olsen. 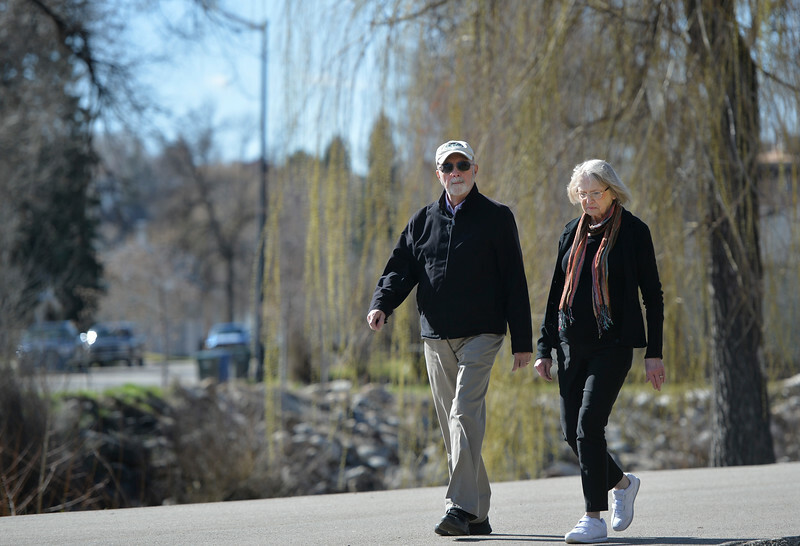 John Meyer and Dee Meyer walk through Kendrick Park on a sunny Wednesday morning. The next several days hold chances for rain with possibility for snow. 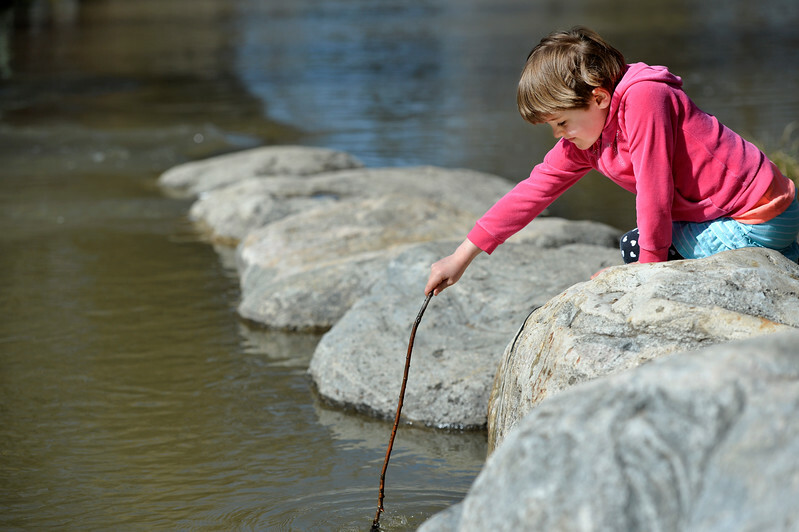 Five-year-old Freya O’Bryan-Herriott plays in the Big Goose Creek on a sunny Wednesday morning at Kendrick Park. The next several days hold chances for rain with possibility for snow. 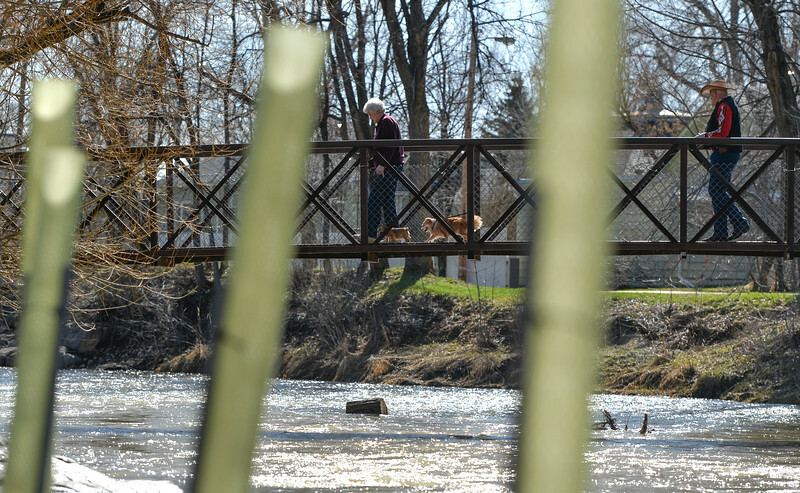 People cross the Big Goose Creek on a sunny Wednesday morning at Kendrick Park. The next several days hold chances for rain with possibility for snow. 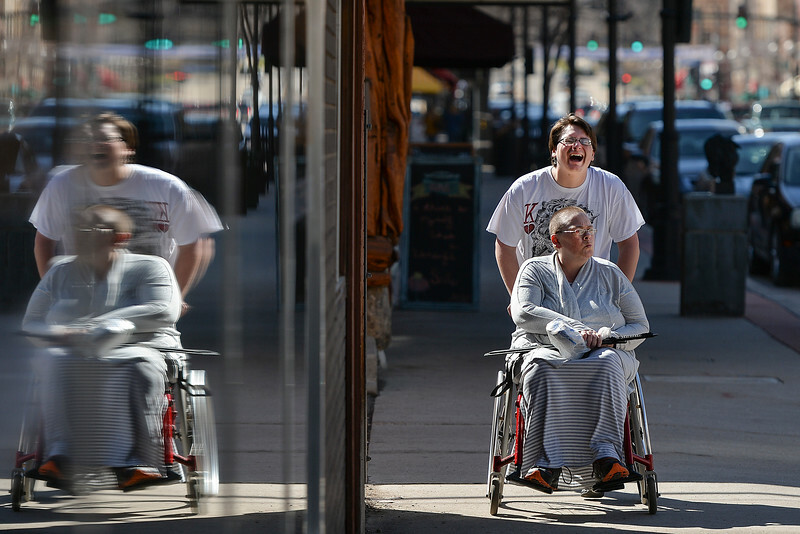 David Chadwick takes his mother Kit Chadwick shopping on a warm Wednesday morning on Sheridan’s Main Street. Chadwick says he takes his mother out when the weather is nice. 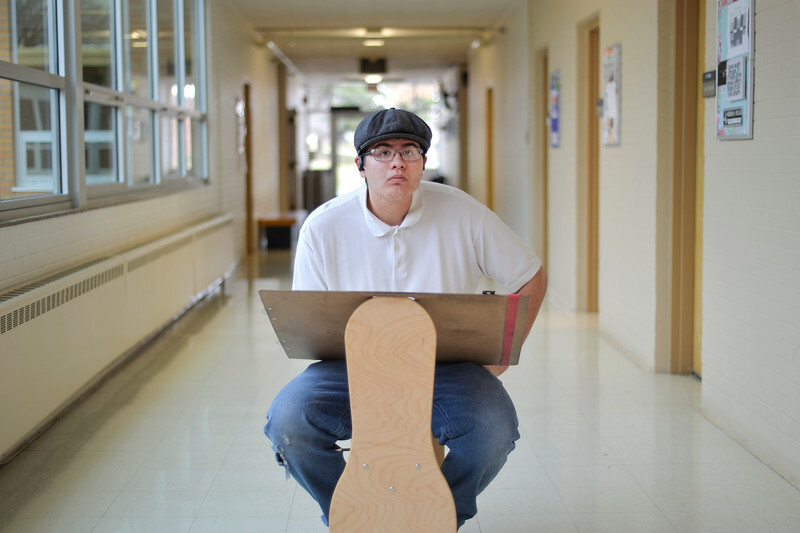 Art student Ty LaBounty looks down the hallway as he works on a perspective drawing assignment Thursday morning at Sheridan College. 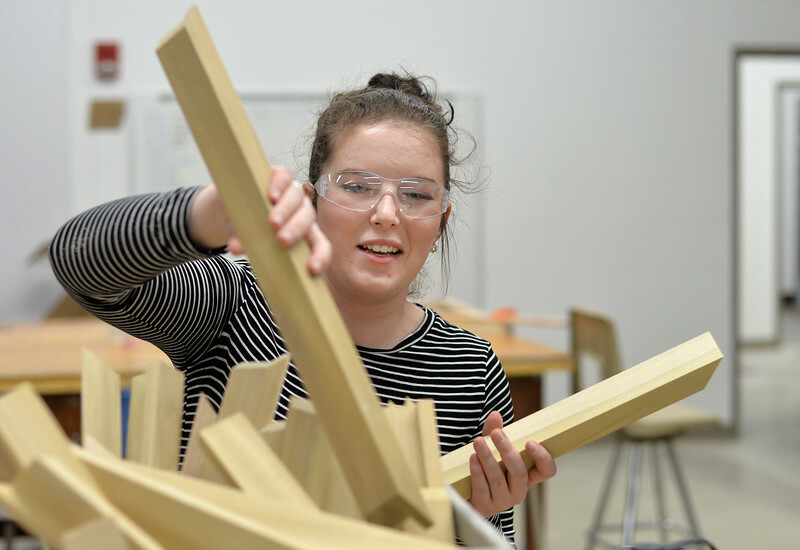 Art student Lydia Johnson pulls wood from a basket during a frame building session Thursday in the Whitney Center for the Arts at Sheridan College. Art students are gearing up for the upcoming student juried show. Instructor Jason Lanka says that students are being held to professional gallery standards. Students will learn the process of making custom frames for their art and how to properly display them. 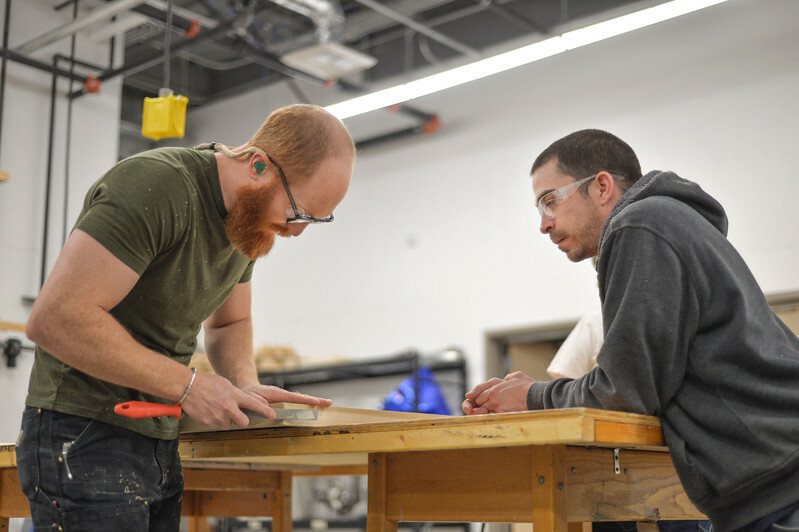 Instructor Jason Lanka, left, shows art student Jonathan Kibodeaux how to file down the corners of a frame during a frame building session Thursday in the Whitney Center for the Arts at Sheridan College. Art students are gearing up for the upcoming student juried show. Instructor Jason Lanka says that students are being held to professional gallery standards. Students will learn the process of making custom frames for their art and how to properly display them. 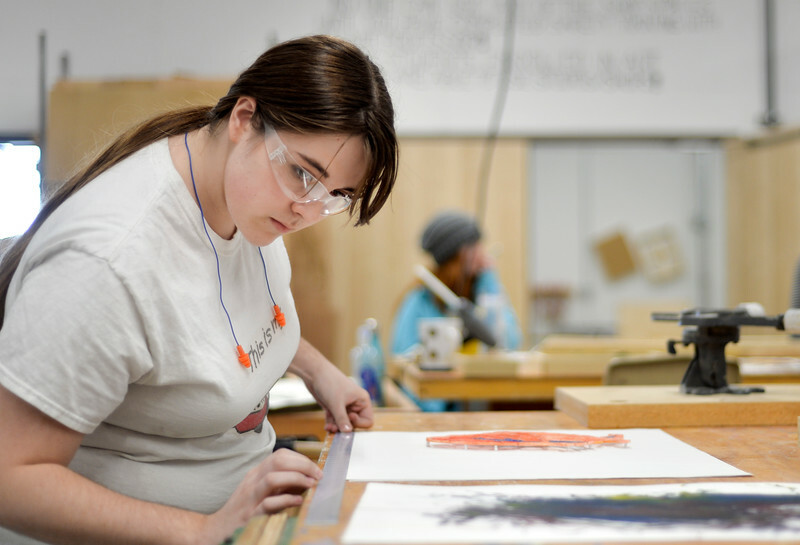 Art student Nichole Wolz measure her art during a frame building session Thursday in the Whitney Center for the Arts at Sheridan College. Art students are gearing up for the upcoming student juried show. Instructor Jason Lanka says that students are being held to professional gallery standards. Students will learn the process of making custom frames for their art and how to properly display them. 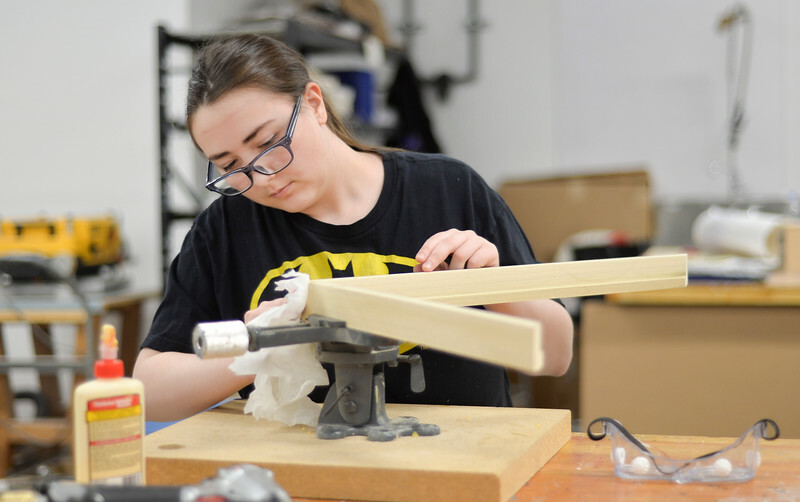 Art student Cecilia Riddle wipes off excess wood glue as she assembles her wood frame during a frame building session Thursday in the Whitney Center for the Arts at Sheridan College. Art students are gearing up for the upcoming student juried show. Instructor Jason Lanka says that students are being held to professional gallery standards. Students will learn the process of making custom frames for their art and how to properly display them. 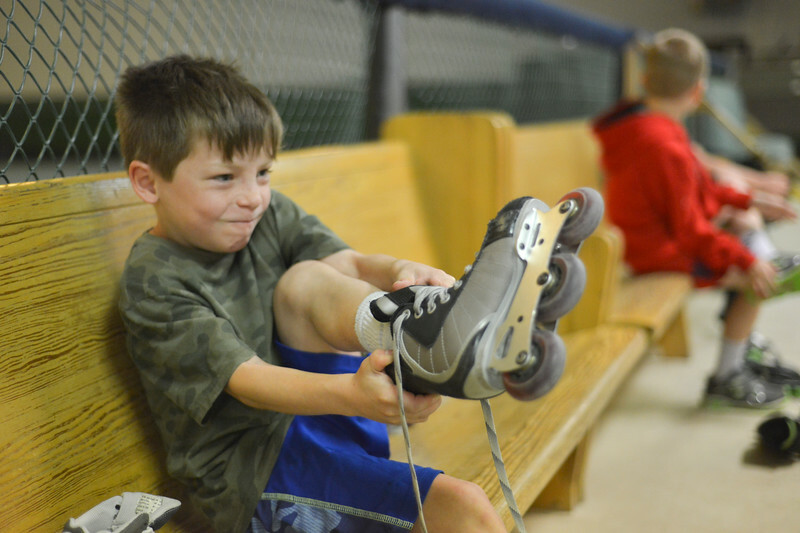 First-grader Blaine Fancher pulls on a pair of skates during the YMCA’s Big Horn Fun Day program at Scotty’s Skate Castle Friday morning. The YMCA offers fun activities for children who go to Big Horn schools since Sheridan County School District 1 does not hold class on Fridays. 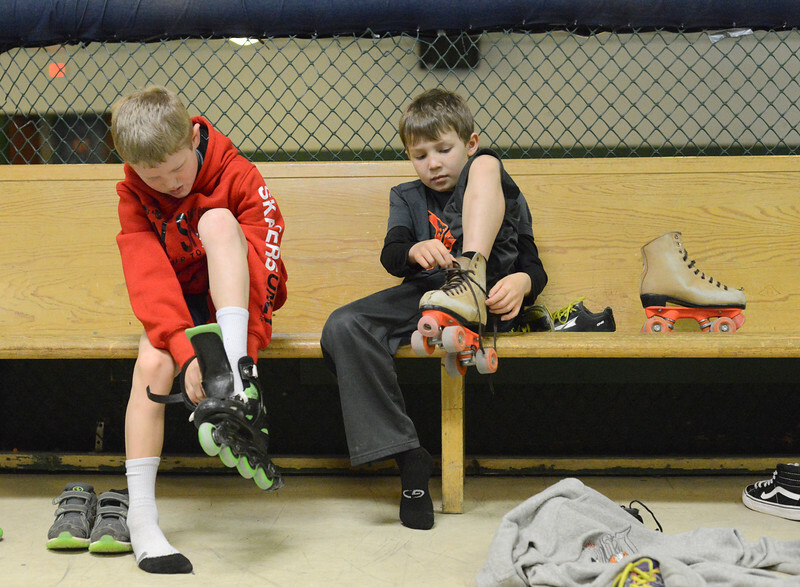 Second-graders Ayden McInerney, left, and Nailin Fletcher put on skates during the YMCA’s Big Horn Fun Day program at Scotty’s Skate Castle Friday morning. The YMCA offers fun activities for children who go to Big Horn schools since Sheridan County School District 1 does not hold class on Fridays. 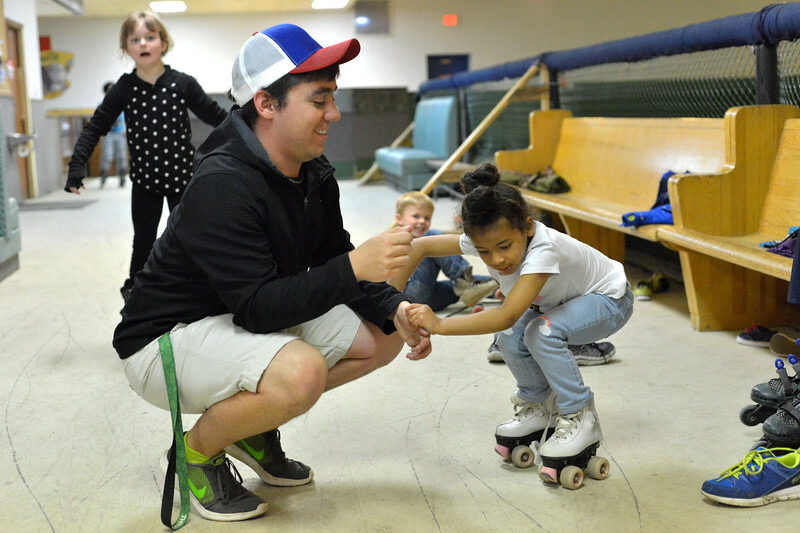 YMCA staff member Tyler Rogers helps kindergartener Treasure Schimka on her feet during the YMCA’s Big Horn Fun Day program at Scotty’s Skate Castle Friday morning. The YMCA offers fun activities for children who go to Big Horn schools since Sheridan County School District 1 does not hold class on Fridays. 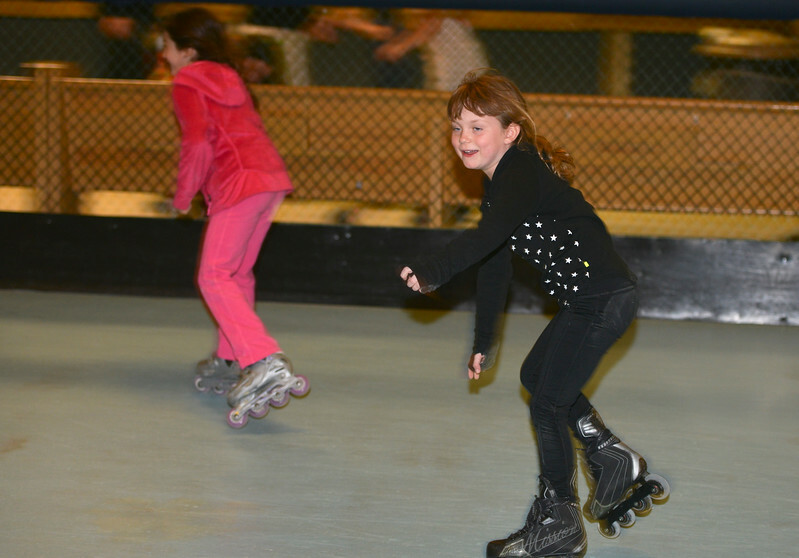 First-grader Stella Dalton glides across the floor during the YMCA’s Big Horn Fun Day program at Scotty’s Skate Castle Friday morning. The YMCA offers fun activities for children who go to Big Horn schools since Sheridan County School District 1 does not hold class on Fridays.